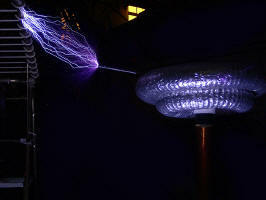 Welcome to my Tesla Coil 1 page. 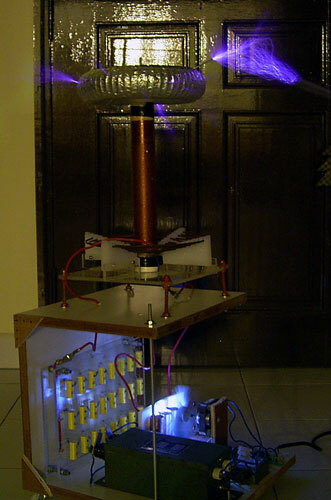 This page documents the design and construction of my first ever (Spark Gap) Tesla Coil including detailed construction details, schematics, design notes as well as photos, videos and diagrams. A Tesla Coil is an air-cored resonant transformer. This may sound complicated, but are actually reasonably simple in terms of general construction. 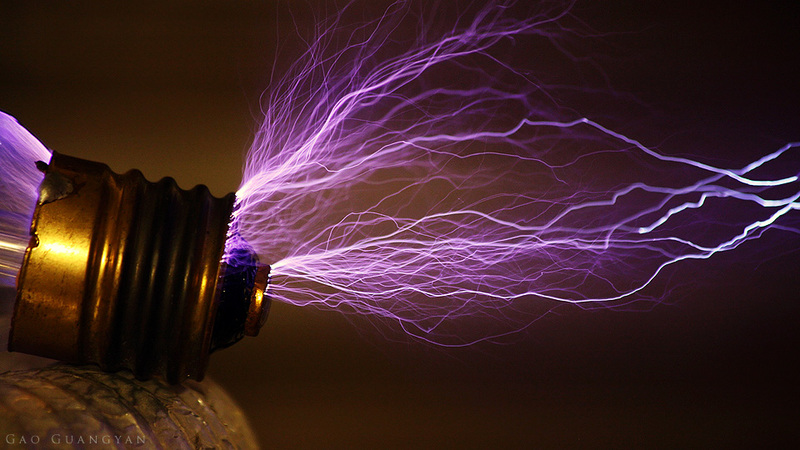 The actual theory is more complex, but a Tesla Coil can be thought of a as a device capable of generating extremely high voltages and creating electrical sparks - basically, making lightning at home. The Tesla Coil was invented by Nikola Tesla, a Serbian-American Electrical Engineering, Scientist, Inventor and all-around Poylmath in the turn of the 20th Century. 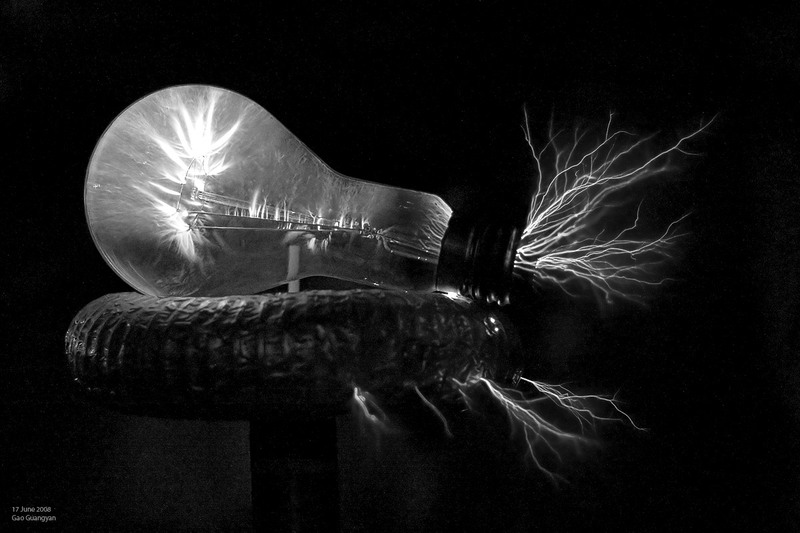 He is considered perhaps the greatest Electrical Engineering of his (and perhaps all) time, contributing inventions like the Radio, the Inductor Motor, the Tesla Turbine, Wireless Communication, AC power transmission and of course, the Tesla Coil. 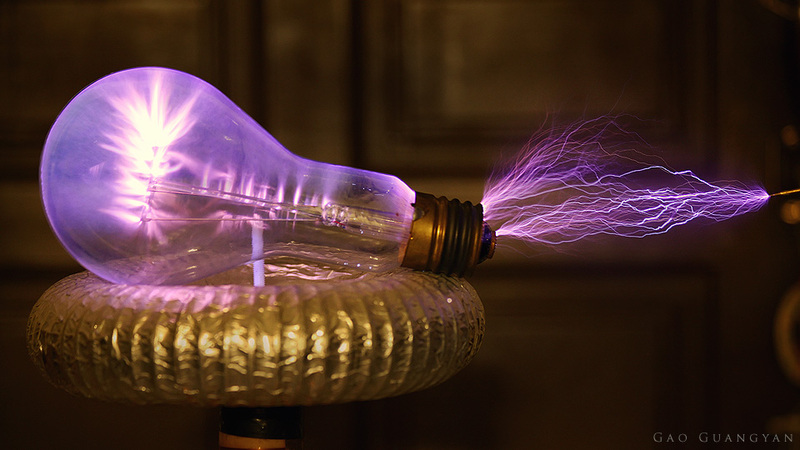 The Tesla Coil was invented with the idea of generating radio frequency waves in the 10s to 100s of KHz - the predecessor of modern radio. These coils were switched via a spark gap. However, since the mid 20th Century, such transmitters have been replaced with modern radio systems. These days, Tesla Coils are used mostly in the special effect industry, but remains a fascinating electrical engineering curiosity - a hobby shared by a passionate and growing population around the world, passionate in making their own lighting at home. 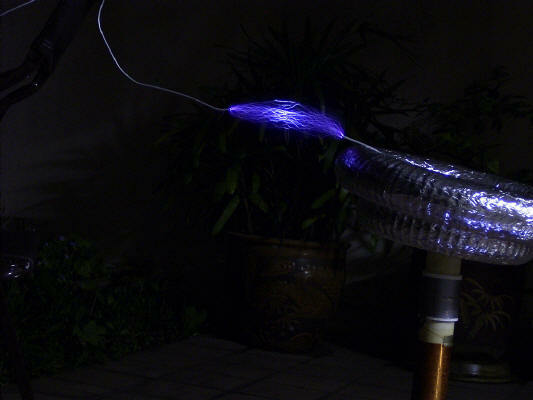 Thus began my Tesla Coiling adventure. 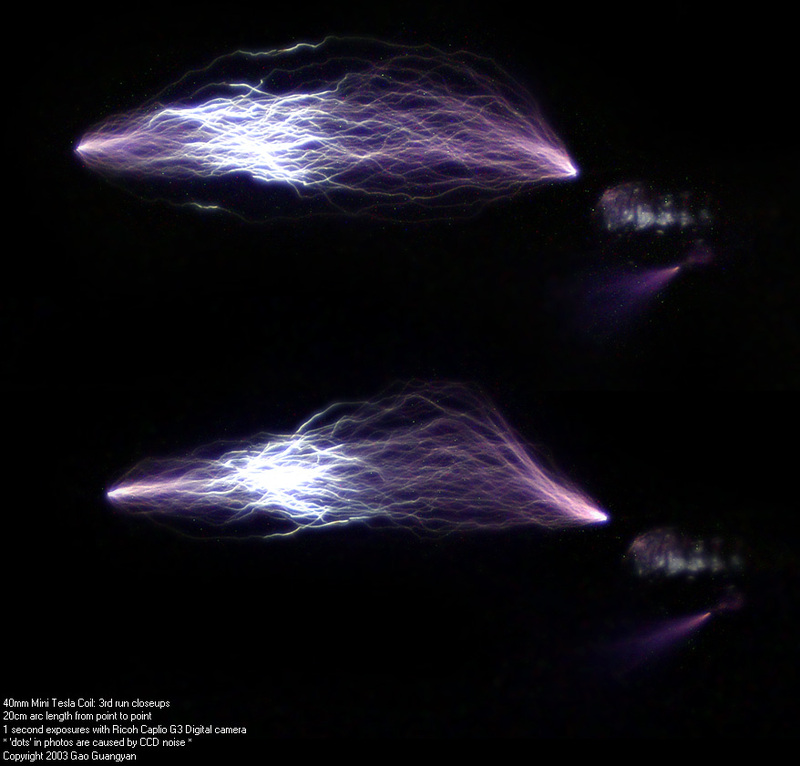 I had seen photographs of a Tesla Coil online just about a year before, and was captivated by the thought of making 'lightning' at home, but felt overwhelmed by the technical descriptions and schematics. 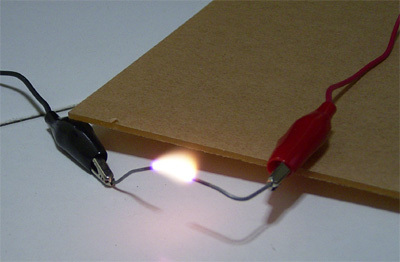 Afterall, I had no experience building anything to do with circuits before and am currently just learning about the basics of electricity in school. Over the past few months, having finally built some high-voltage circuits with Flybacks and ignition coils, I felt it was finally time to pluge in and begin building my first Tesla Coil. Since it is my first attempt at building a Tesla Coil, my aims are to produce a small, relatively good-looking, working spark-gap tesla coil, to more to learn about building tesla coils, and to gain invaluable experience. 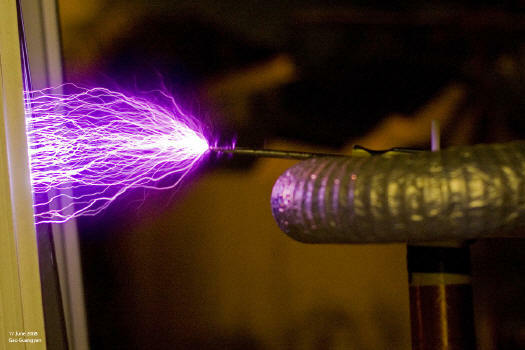 This page will index my construction efforts as I update it continually during the course of my tesla coil construction. It will be updated frequently, with the most recent ones at the bottom. 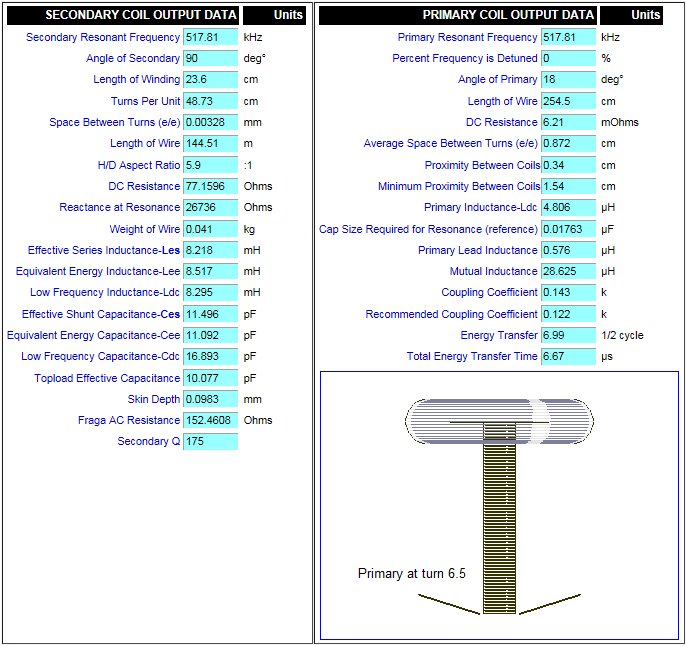 Updates Apr 2013 - I dug up the specifications of my coil and ran a simulation of the coil on Bart Anderson's JavaTC. Click the image on the right to see the results in full. The calculations show that the resonant frequency of the coil is around 518kHz. Also, using the specifications as shown along with the 6kV 30mA transformer, the recommended Resonant Cap Size is 15.9nF with an estimated max spark length of 50cm with the spark gap set to 2.5mm. 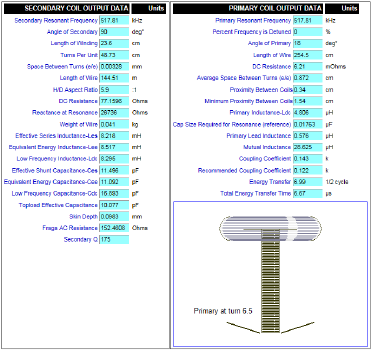 Clearly the coil is not yet optimized and if time permits, I plan to go back and tune up the coil. Improvements include reducing the physical size of the capacitor bank (or building a new one, now that I have a bunch of CDE Polypropylene capacitors), and improving the spark gap. However, it might be simply to re-build the Tesla Coil. More updates to come! 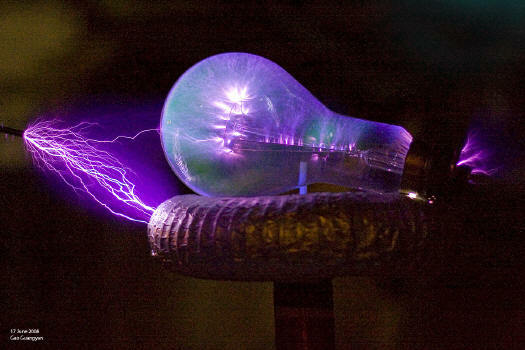 Today marks the beginning of my Tesla Coil Journey! Construction begins today! I have recently acquired a Neon Sign Transformer for my power supply. It's the unit as pictured below. I passed by a Neon Sign shop in Chinatown and asked for a used/old/spoilt transformer. Luckily, they had some extras. After much persuasion, they gave me a supposedly spoilt unit. It is a F.A.R.T. brand transformer. (stands for Fabbrica Apparecchiature Radioelettriche Treviso I think.. It is the best selling neon sign transformer in the UK by the way. www.fart.it). 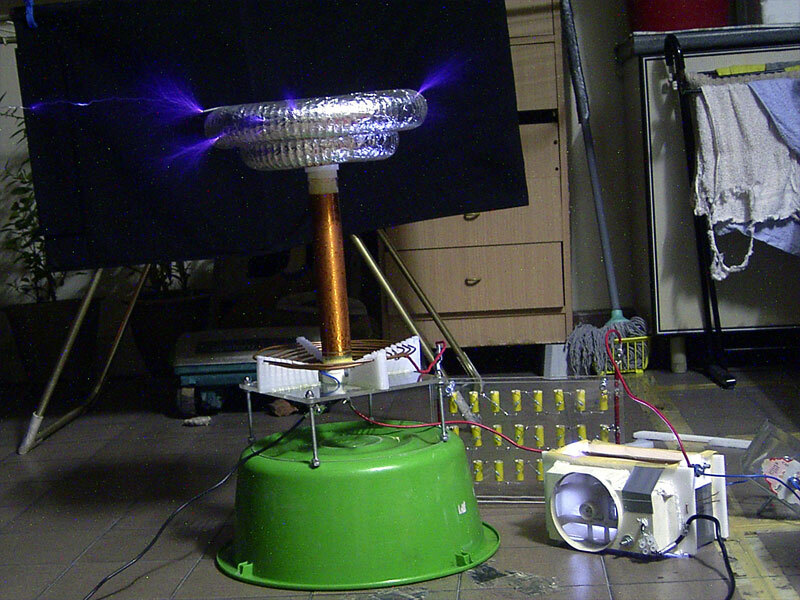 It's a 15kV 30mA unit, and weighs around 7+kg. The whole thing is potted in a resin block and comes with a zinc mounting plate. This design eliminates rusting and is a very sturdy transformer. I carried the heavy unit back and went home to test it. Apparently, only one secondary winding had shorted but the other half was in working condition. This makes it put out approximately 7.5kV 30mA. Just what I was looking for, for my small coil. 15kV would be a bit on the high side and make the capacitors expensive. 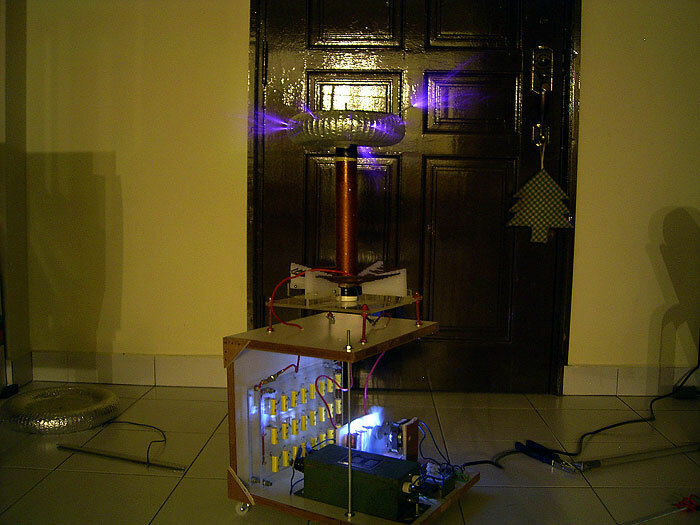 Although this makes it not a very powerful unit (especially since half of it is useless and taking up extra space), it is still relatively small and delivers 225Watts with this configuration. I hope to get around 1 foot arcs from this system. However, I did not receive any High Voltage cable along with the transformer, so I guess I'll have to go find some... I'd probably be using this unit for my coil, unless I find another one in better condition. To test if it was working, I hooked up the mains and powered it on with half of the high voltage windings. Btttztztzzttzz! It works! At least I know that this thing can output the 7.5kV at 30mA I need. Above is the picture of the arc. 30mA is quite high (quite enough to kill!) resulting in a HOT fiery arc. I will make a large Jacob's ladder too to celebrate this find! At least I got this transformer for free! 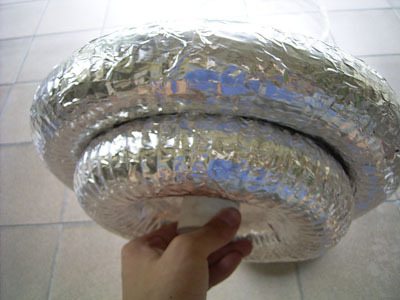 Tomorrow, I plan to buy materials for my toroidal top load... I have acquired a large roll of aluminum tape for $15 (thanks Mum!). It expensive but my mum was really nice and bought it for me. [On hindsight, I really shouldn't have bought it at a shopping centre - it's twice the price compared to those sold in industrial estates.] I would be constructing the top load and hopefully the spark gap (set at 8kV) tomorrow. Progress has been slow due to the un-availability of parts... until now. I have finally got most parts more construction can start. 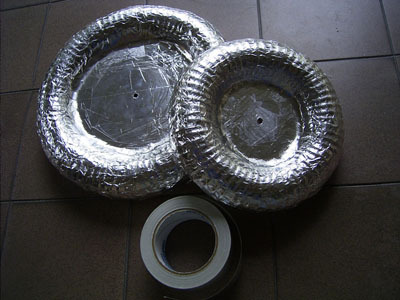 I've decided on a double toroid design, one large diameter one resting on a small diameter toriod, for better E-field shaping and increased capacitance The topload is constructed using flexible PVC ducting stuck together to form a torus, tapped with masking tape to smooth out the corrugations and taped with aluminium tape. PVC Corrugated Drain Pipe, Larger toroid taped up...., complete small toroid with nylon screw. The small toroid took around 2hrs to make. The small one is approximately 23 x 5.5cm. 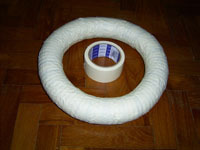 (23cm being the total diameter and 5.5cm being the pipe diameter). A commercially spun toroid would cost well over $100 new. Building this cost less than $20 and is extremely simple to make. The first thing I did was to cut the centre disk out of some surplus plastic I had lying around. It's about a 12cm dia disk. After cutting with my saw, I drilled holes around the perimeter of the disk at roughly 1 inch intervals. These holes will hold the wire used to tie the PVC pipe to the disk. 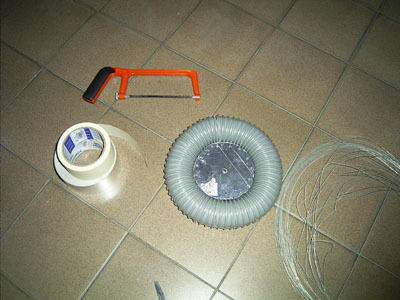 After coating the disk with aluminum tape (plumbers tape), I tied the pipe to the disk. The pipe I used is a 2" Flexible PVC drain pipe. I just bent the twisted wire into the grooves of the corrugated PVC pipe. The pipe will automatically fit around the disk :). It's not that easy as it looks... Following that I taped the whole pipe up with masking tape, to provide a smoother finish, and finally, the aluminum tape. Basically.. it's done! I bought some nylon screws to attach it to the secondary coil. 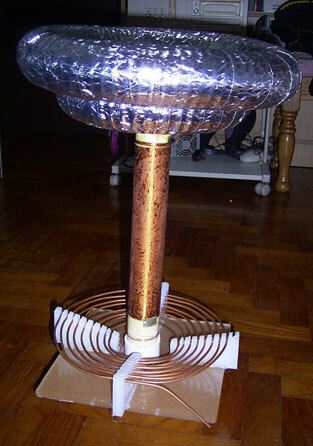 The larger coil is still needs to be wrapped with aluminum tape. Over here, flexible corrugated PVC pipe and aluminum tape don't come cheap. I thank my parents for supporting me financially :). That's it for today. I'll continue the other toroid tomorrow. It's a nice smooth toroid after smoothening it with the back of a spoon. I completed the toroids today and fixed the spark-gap together. 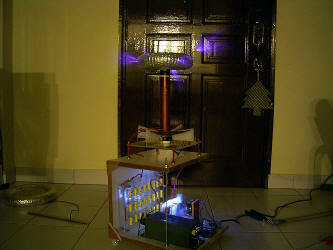 The spark-gap is not fully completed as I still need the fans and attach them to the gap to quench the sparks. More than 4 hours of work today. Here is the 2mm acrylic disk to be fitted in the middle of the larger toroid, which has been taped up with masking tape to smoothen out the ridges. The disk is approximately 21cm in diameter. 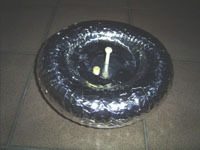 The toroid is about 32cm in diameter, and is made from the same material as my smaller toroid (2" corrugated PVC drain pipe). Here, the acrylic is being taped up with aluminum tape using the same method as my smaller toroid. Looking good.. disk has been attached with wire to the torus. Both toroids completed! Everything is screwed together to a PVC end cap with a nylon screw. Both toroids took a total of 4 hours to construct. Sure beats spending a few hundred dollars.. :) There's nothing much to do after the examinations anyway. 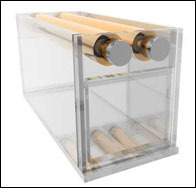 The PVC end cap is to facilitate easy attachment to the secondary coil. Not bad for my first attempt at toroid making I think. Later in the afternoon, I got more materials and built the spark gap. 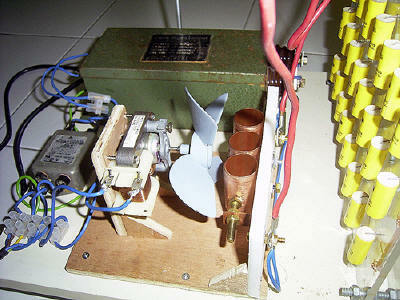 It's a basic "sucker-gap" design, using two copper pipes as the main spark gap all housed in a plastic box with two fans to quench the arcs. I realised that those white plastic chopping boards would be much more ideal than acrylic. It costs two times cheaper for the same size (if not bigger) and is a whole lot easier to saw. I only have a hand saw.. a Jig-saw would save lots of time... Here's my design. It's really very simple. 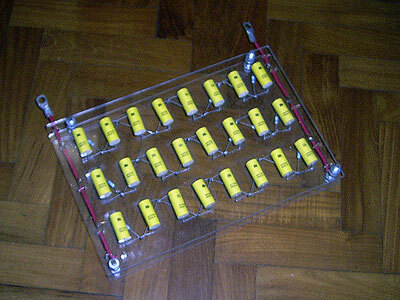 The plastic box houses the two copper pipes, electrically connected internally to the threaded rods holding it to the box. 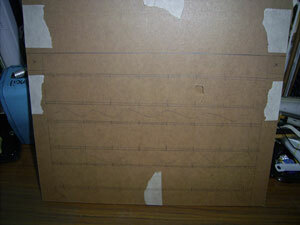 The two square holes on the side of the box are made to accommodate standard computer 80mm fans. I have a 4 Amp 12V power supply for the fans so it shouldn't be a problem even for high powered fans. 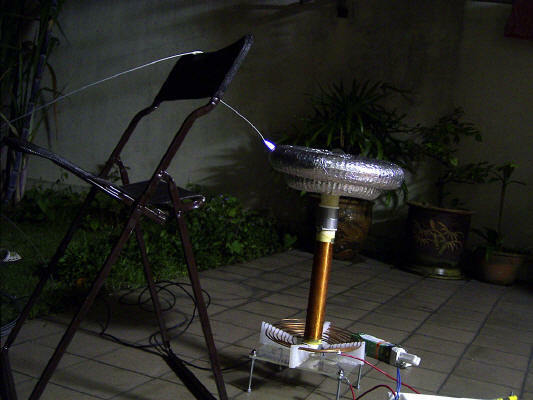 At the low power my tesla coil will be running at, it shouldn't get too hot at all. It's looks easy to build, but it's not without proper cutting equipment :(. The whole gap took around 2 hours to make, except for some places which need to be covered up, and another fan. The air must be forced only in between the spark gaps due to the limited amount of air flow I can get with the fans. Here's the uncompleted spark gaps made out of chopping board plastic, 22mm copper pipe, threaded rods, contact cement and hot glue. 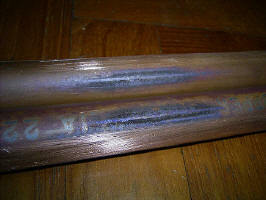 The copper pipes are 22mm, 200mm long each, and the whole cap is 10cm wide. Looking good too :). Looks like today has been a rather successful day. I can't do much during the weekdays due to school, so I'll have to cram more stuff during the week ends. I am now left with the filter network, capacitor bank, secondary coil, primary coil / supports... lots more work to do. I am thinking of fitting all components inside a nice box..
Not much done today. I made a simple poor-man's rig and after drying my 40mm PVC coil form, I varnished it with polyurethane. The set up is basically a wooden rod through the PVC, stuck with duct tape, and tied in between 2 chairs. The handle is a piece of thick wire and a short copper pipe. This allows me to wind the PVC as I apply the varnish. It's not as easy as it looks. Anyway, I kept rotating the pipe for about an hour with a fan blowing to allow it to set before I let it dry for the night. It's tiring. Although it's not smooth, I'm going to fine-sand the uneven parts down before I can wind my secondary coil! 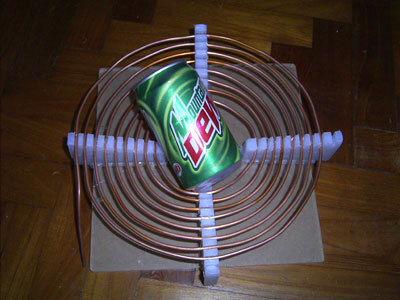 I completed the Primary coil today. 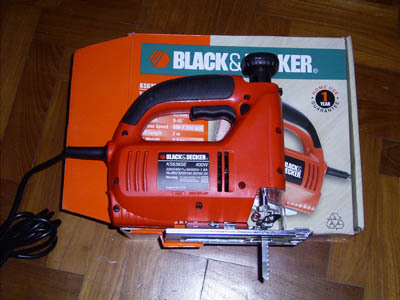 I have also acquired a Black & Decker 400W jigsaw. It really saves a lot of time. Thanks to my mum for sponsoring the new tool. No more messing around with tiny hand saws, this is THE machine! :) With this new tool, I proceeded to fabricate the primary supports. Again, appreciation to my mum for finding and letting me use a piece of chopping board as the support material. 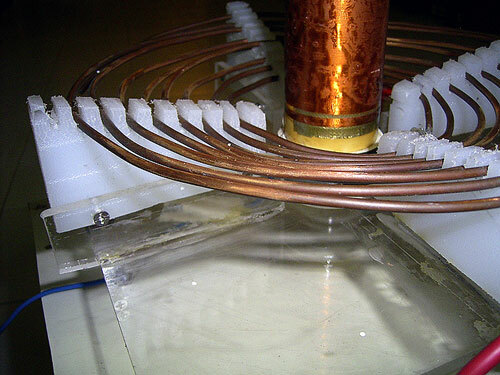 Geometry of Primary coil: Inverse conical with a ~15 degree slope. Above it is with a can for comparison. The back protective layer of the acrylic hasn't been peeled off yet, which is why it looks brown. 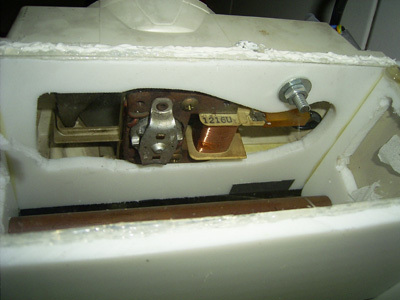 I have attached a 40mm PVC end cap with a nylon screw to the centre of the coil to allow easier connection of the secondary coil to the primary coil. Hopefully, not too bad for a beginner! Again, due to lack of parts, I was unable to continue. 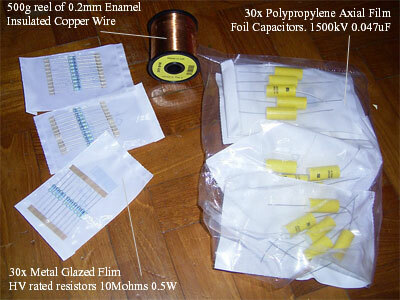 However, yesterday my dad helped me purchase 30 capacitors, High-Voltage rated resistors and 0.2mm enameled copper wire. I purchased acrylic and thick wires today, so work can finally begin again. 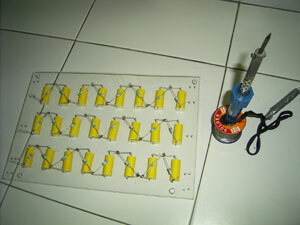 Today, I completed the primary capacitor bank using a MMC (multi mini capacitor) setup. The capacitor is a critical element in the tesla coil. Critical because it is really punished by the oscillations of the Tesla tank circuit. The tank current can easily reach a value of several hundred amperes. 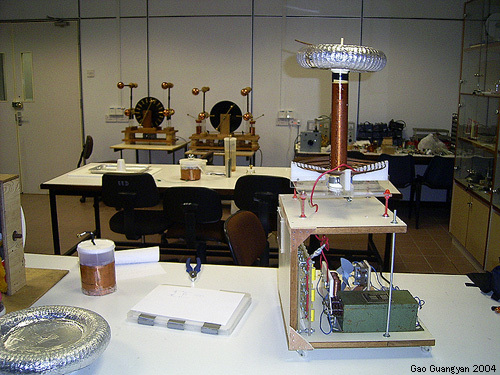 The RF (radio frequency) produces intense stress on the dielectric of the capacitor. 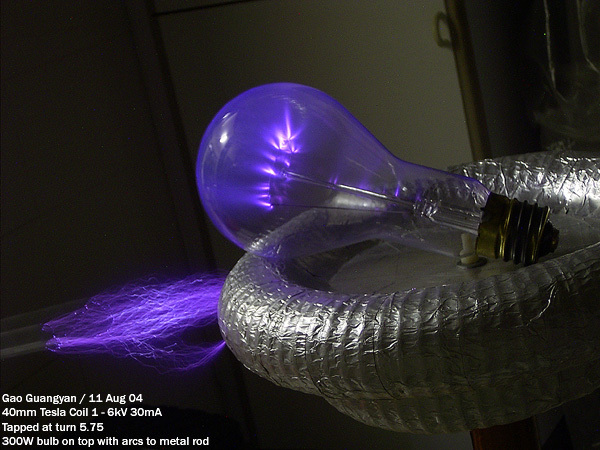 Professional pulse discharge caps with the values needed for Tesla coil circuits usually cost upwards of a few hundred dollars (depending on the capacitance and voltage value), so most coilers try make their own. 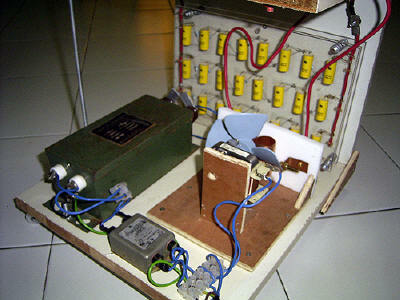 One of the best approaches is to connect many small pulse caps in series/parallel and build a MMC (Multi Mini Capacitor) bank. This seems to be the ultimate solution as a 20nF unit rated for 10kV in tesla coil use cost below $50 when build this way - and this is a perfect cap build by professionals (at least its components), which is why I chose to make a MMC versus other designs such as a self-rolled capacitor or a salt-water-glass-bottle capacitor bank. According to The Geek Group's capacitor design chart, the resonant cap for a 7.5kV 30mA transformer at 50hz is 0.0127uF. However, a LTR (Larger Than Resonant) Cap of a desired value of 0.0191uF(19.1nF) is recommended - LTR caps reduce the chance of over-volting the capacitor and transformer, as well as increasing the bang size and power throughput. In other words, thicker, longer sparks with less chance of damaging components. 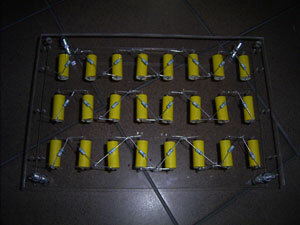 After searching, I located some nice 1.5kV 0.047uF Film-Foil Polypropylene Axial Capacitors by RS electronics. 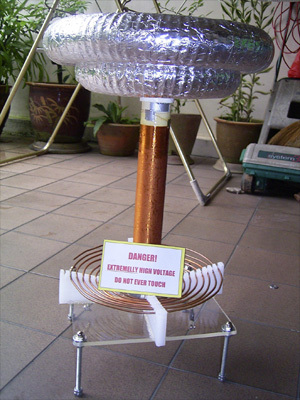 They have a very low loss dielectric suitable of continuous use at high AC voltages and will withstand fast rise time pulses, as well as having excellent high frequency performance, exactly what is needed for a Tesla Coil Cap. After calculating, I acquired the above components. 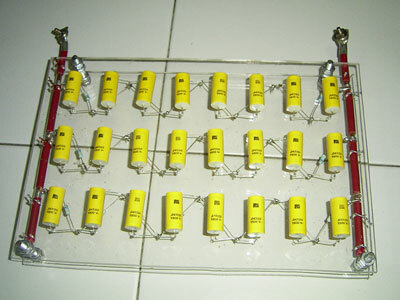 The 10 Mega Ohm Metal glazed High Voltage resistors are wired to each capacitor to drain off the charge after use to prevent shocks, as well as to regulated the voltages. Here's how I wired up the capacitors. 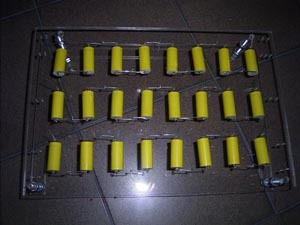 The MMC consists of 24 Capacitors, 3 strings of 8. The final value of the whole cap bank is rated at 12kV at 0.017625uF (17.6nF), close to the LTR value of 0.0191uF. It's been designed with adequate spacing to provide some sort of voltage stand-off and to help in cooling. Everything is drawn out nicely on the acrylic sheets.. and they are drilled and cut all by hand. The capacitors are slotted in... and their ends are wired up in series. Than the resistors go in.. and they are soldered up together. Details of the competed bank. 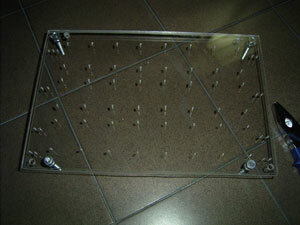 The bank was mounted on a 6mm clear acrylic sheet with a 5mm backing. However, I have to fix the termination connections at the end of each capacitor string. My current 40W soldering iron just can't heat the large copper cable hot enough for the solder to stick. The completed bank is visually appealing :-) and took around 3-4 hours to construct. 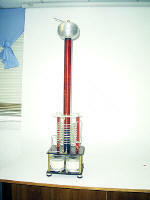 It cost less than $40 to build - much cheaper than a few hundred dollar pulse capacitor. 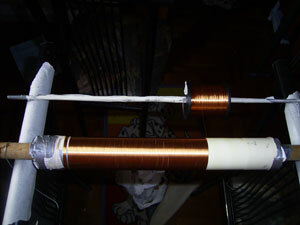 I completed winding the secondary coil today! 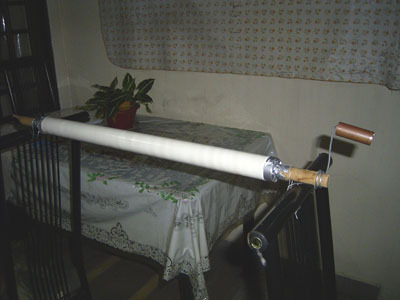 My coil form is a 40mm diameter white PVC pipe. It has been dried and sealed with polyurethane varnish before winding. I have decided on a 1:6 winding ratio to add more turns in the secondary, and to allow use of slightly thicker wire (thin wire breaks too easily). I used 0.2mm wire (about AWG32?) and wound about 24cm (actually 23.6cm). With 99% fill, I get about 1100+ turns. 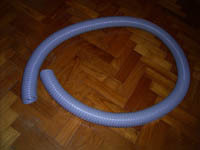 The whole coil was wound by hand and took around 1 hour plus. Above is the poor-man's winding setup.. I threaded a wooden dowel though the PVC form with cardboard end supports and the whole thing was kept in place with duct tape. It was then tied to a chair with wire, and was allowed to turn freely. (Okay, not so freely... ) The 0.5kg (about 1600m of wire) reel was supported by a surplus metal rod and could spin freely too (appreciate to my dad for purchasing the wire for me!). I taped the ends of the wire with duct tape.. not that nice but at least it works and sticks well. I'll just varnish over everything in the end... Winding was tiring especially for the fingers but it was all over in about an hour. The specs say 0.2mm wire, which indicates about AWG32. And there you have it, my first complete coil! It shines like a copper tube! As you can see, I've left quite a bit of extra wire at the ends. As I write this, the coil has been fully coated with polyurethane and is drying. I plan to put 4 to 5 thick coats, with fine sanding in between each coats to remove irregularities and give the coil a smoother finish. I have completed coating 4 thick coats of polyurethane varnish for protection. Due to my lousy coil setup, thick bristled brushes and lack of skill, the varnish did not apply smoothly, and there were lots of irregularities (high areas) which provided a lumpy feeling. I wet sanded before the 3rd and 4th coats. However, the secondary finish was not what I hoped for, clear and smooth, but had a sort of 'rusty gold look..' However, it still provided thick insulation which was what it was meant for. The matte finish is due to the sanding, and I plan to fix this in the future. The toroid is clearly not so smooth.. I have tried smoothening it out but it's not working very much. I shall see how it works out first. I made the RF ground rod today. 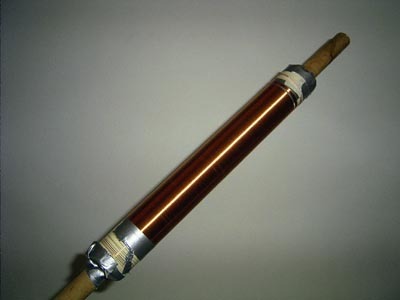 It's a 22mm x 1' long copper tube. 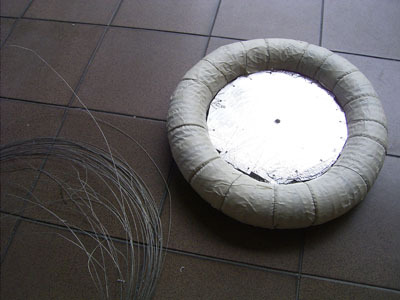 The wire is 3m, 6mm2 7 wire stranded PVC insulated wire and is connected to the copper tube with aluminum wire lugs with a stainless steel screw and nut. I have also made a safety spark gap consisting on threaded rods, nuts, hex end caps and a plastic container. It's a simple but effective design, and can be easily and accurately tuned. 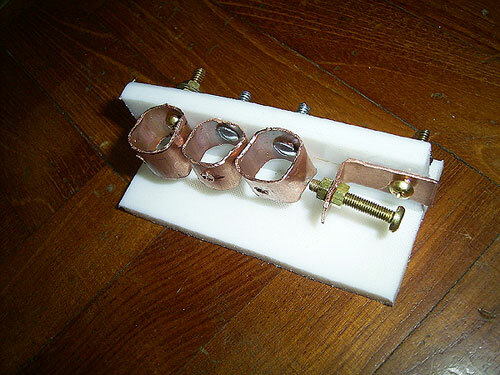 This is the primary tap made out of a fuse holder. There's quite a lot of surface contact, and is very easy to tap. Almost everything is done and all I am left with is the tuning and connections! I can't wait to fire it up! This is my more-or-less finalized design. 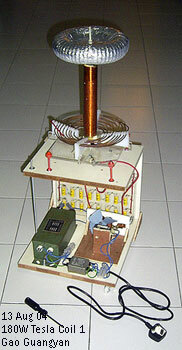 Below shows the complete schematic of my coil. Mains is 240VAC 50hz with a 13 Ampere circuit breaker - More than enough power! 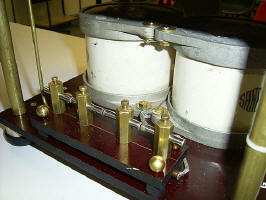 I am using a 3 Amp rated EMI filter for 240VAC. Again good enough. The variable autotransformer (variac) is a 500VA model. I mostly use it to tune my spark gaps. Apparently, the variac seems to be restricting current flow and my coil performs better without the variac. Appreciation to my parents for funding the $50 500W variac. 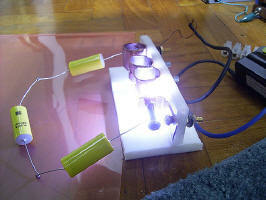 I got my Neon Sign Transformer free from a neon shop because it was 'spoilt'. It's a 15kV 30mA unit and half of the windings got shorted out, so I am using half of it, 7.5kV 30mA and the other end is sealed up. 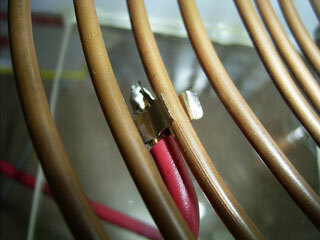 (s.g.) is the Safety Gap to protect my capacitors and the neon sign transformer. L1 and L2 are chokes, basically insulated wire (same wire as my secondary coil 0.2mm) wound 1 layer on a pen tube. This prevents the high frequency AC from traveling back to my transformer. However, I have been informed that it is not needed and the coil will work perfectly well without it, so I left it out. (m.g.) is the Main spark Gap made out of two long copper pipes which can be accurately tuned. 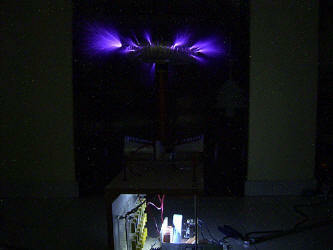 C1 is my main MMC design capacitor bank rated at 12kV 0.017625uF (17.625nF). (p.c.) 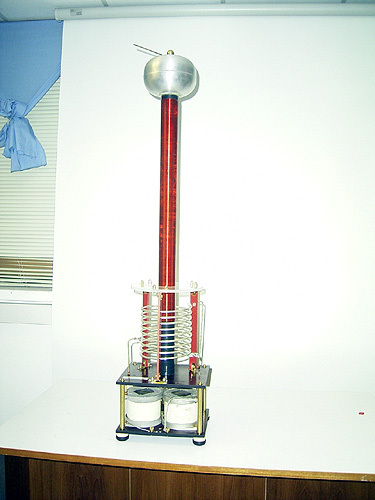 is my Primary Coil with 8+ tappable turns. I used a small diameter fuse holder as an adjustable tuner. s.c. is the secondary coil. 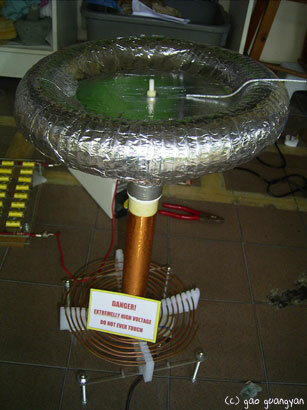 The toroid is a double toroid design for more capacitance and to improve electrostatic field shaping. It's official - construction is complete! I completed all the connections and fixed everything up in my tiny backyard. After tuning..: 10cm and 15 cm arcs. This is after tapping the secondary at turn 6. At first light, it was as turn 8. Spark length, brightness and noise improved a lot. This coil can make small fluorescent bulbs light up dimly nearby. However, I am still not satisfied. 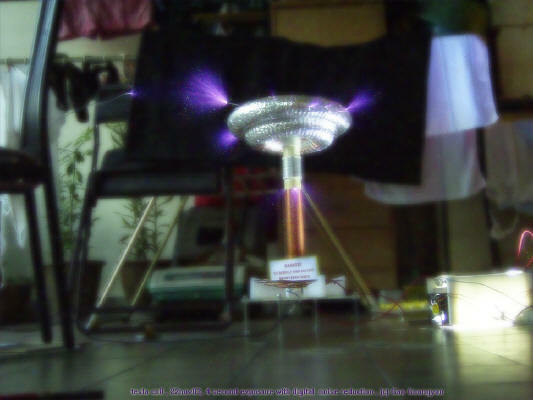 There is NO breakout from the toroid, and with a breakout point, thin, purple, corona like discharges can be seen. The arcs are really thin, and I believe my spark gap is set too small. However, It was time to pack up. I'll do more work soon! I aim at least 40-50cm arcs! My coil is surprisingly quite quiet.. I think it's my spark gap. I have fans at my spark gap, but they have mysteriously stopped working. Now I am running the gap without the fans for quenching for now.. Here's the setup. Await better news for the next firing! 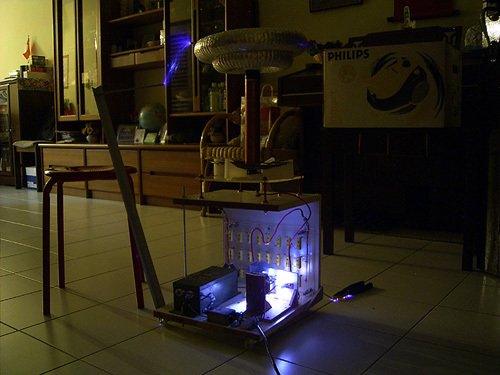 Note that I have used a bridge rectifier to power the 12VDC fans. It's SECOND LIGHT today! 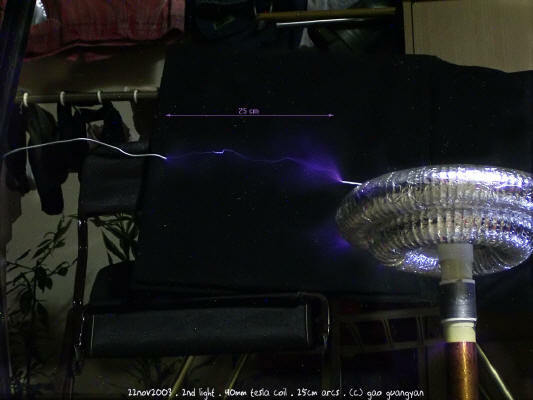 Thanks to the people at www.4hv.org (4hv forums) and www.thegeekgroup.org (geekgroup forums) for helping me debug and give suggestions to improve performance of my tesla coil. *click on pictures to enlarge. Due to long exposures, there is significant 'noise' in the photos. 4. Sparkgap is still running without the fan. So far, the sparkgap and safety gap are holding up fine. One design flaw I have is that the secondary height cannot be adjusted to fix coupling. Also, I did not make a portable cabinet with wheels to move it around.. However, it is quite well mounted. I am pleased with the toroids. Using only one toroid instead of two led to small arcs. Now, the sparks. Everything is the same as run 1 except for the increased space at the sparkgap and the primary is tapped at turn 5.75 instead of 6.5 / 6 of the previous run. Second light. Click to view in full! There is finally breakout from the toroid! (none on run 1). Arcs are still wimpy and thin, but they are significantly longer. The coil runs louder and fiercer too. This is a 4 second exposure. My digicam doesn't do well in long exposures and there were A LOT of artifacts and noise. I tried to clear it up though.. the bright box on the right is the spark gap. Note the multiple breakout points. Something that is making me concerned is the corona at the top of the secondary.. I think I need to insulate it more before anything bad happens. Right now, there is no actual streamer. Output looks more like heavy corona and they are extremely thin and dim... but much better than first light. 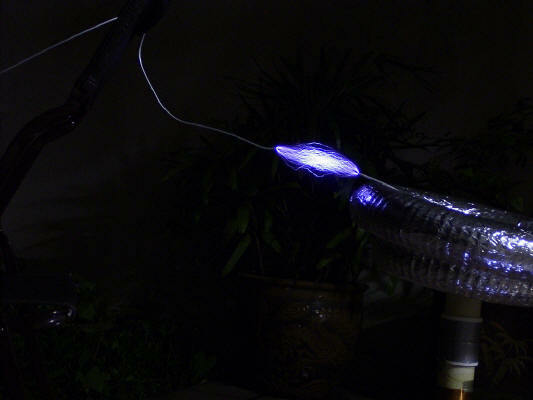 The streamers are purplish blue to air and are bluish white when connected to ground. 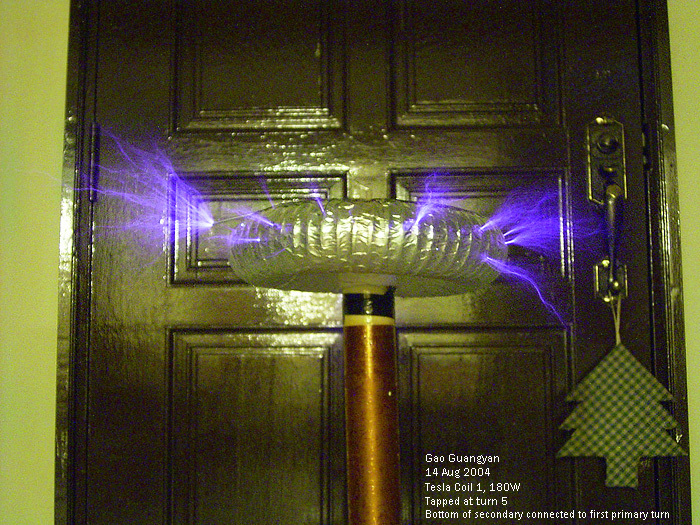 [Update - the corona is due to the very high voltage at the top turn of the secondary coil. This is fixed by moving the toroid lower]. Trick photography. This is two photo overlaid over each other.. about 18cm arcs. Highlight of the day! 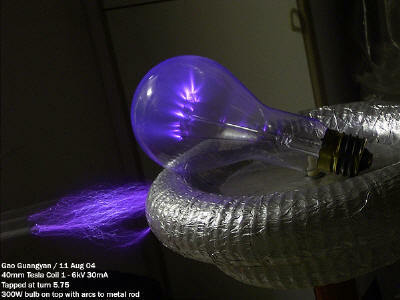 My coil has acheived a spark length of 25cm! The improvements have significantly improved spark length and overall, the coil is much louder. The arcs are very thin... notice the safety gap firing in the first part of the video as a very bright light. Some parts of the coil have been slightly changed and the spark gap has got a new fan! And here's the new spark gap! The fan is from a microwave oven. It's powered directly from the mains and is very powerful. My previous two computer fans mysteriously died, possibly due to the RF. Anyway, I needed a step down transformer and a bridge rectifier to power those CPU fans.. it's much easier and tidier now with the microwave oven fans. 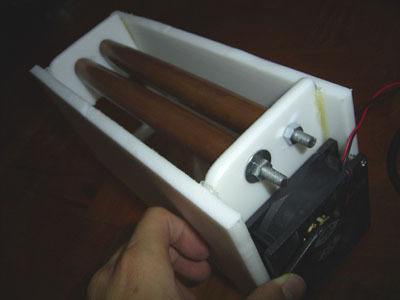 The original fan casing was kept (but was sawed to fit). A large hole was cut at the side of the gap. You can see it in the second picture (through the clear acrylic bottom plate). 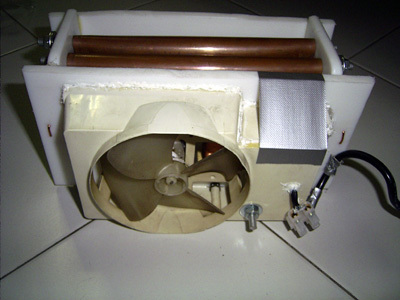 The fan is connected by a large bolt, friction, hot glue, silicone sealant and a touch of duct tape to complete it. The original fan holes were covered with duct tape.. simple but effective. The fan roars now. :-) I am hoping this would improve things a fair bit.. took around 1hr to make all the changes with the gap and the secondary setup. The added fan HAS indeed improved spark brightness and thickness quite a lot! But there is no significant spark length improvement. The coil now runs much louder and fiercer. 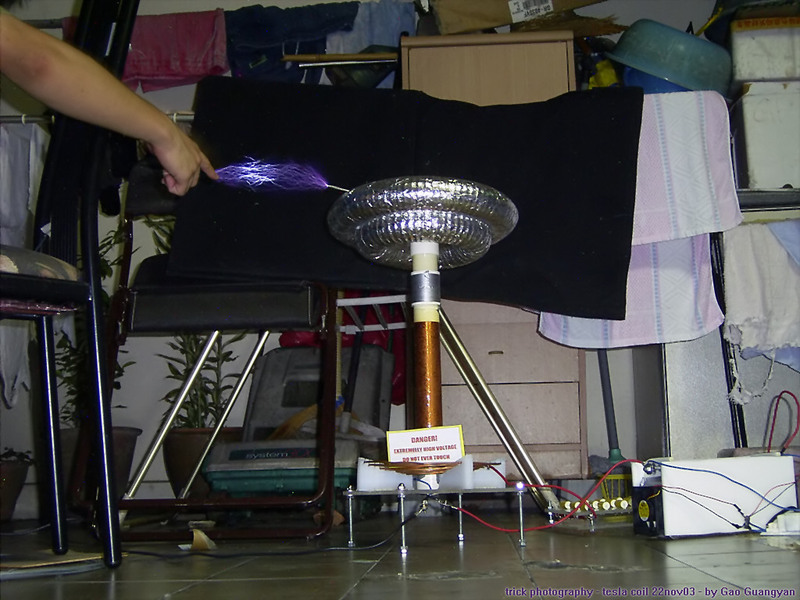 The noisy fan is completed drowned out by the spark gap. Much thicker arcs! 20cm. There really is a difference! These are really beautiful. Again 20cm length, but the camera is much closer now. However, there is still no 'real' large streamer. I think my toroid is too rough, preventing breakout. I shall try to smoothened it and see how it all works out. The new spark gap has really made a lot of difference I am am pleased with the new results. I still want to improve spark length and I shall see if I can get it up to 40cm. Everything's still holding up fine. Ozone smells terrible.. Tomorrow is Singapore's 39th National Day! Due to that, there are 2 free days as holidays. (Actually, I can't really call school holidays 'holidays' anymore because we are given stockpiles of work which is extremely stressful and pressurizing. School is definitely not helping the progress of this project! In any case, work must go on, and thus I have decided to tweak up the coil! And there you have it, the new adjustable static spark gap. 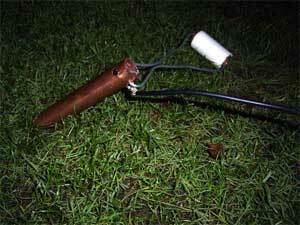 It consists of 3 fixed copper rings screwed down to a HDPE stand. There is one adjustable brass machine screw as the last electrode. 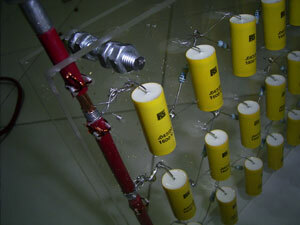 Termination electrodes are all brass. Although this probably can't handle as much power as the first big one, it's much smaller and this time, no steel! I'll probably add a powerful fan blowing across the gap to assist in quenching as well as to prevent it from over heating. It's probably not the nicest looking gap, but it seems to work great. In the second picture, you can see the gap firing from caps charged with my flyback. I am hoping at 225W of power, the gap won't overheat too quick though, otherwise I will have to make a new one. I'll probably build a stand to encase all the components too. Hopefully I can find more time. 9th August: I built a wooden stand, with 2 decks (2nd deck supported at one side and one edge, but still strong). I also cleaned up the dusty capacitor bank and changed the output lugs to thinner wire. Why thinner wire? The previous thick wire was too think and soldering was impossible. Now, although the wire is thinner, the connection is much better (soldering is possible now). When I powered the coil up, it worked for a while, then it stopped. 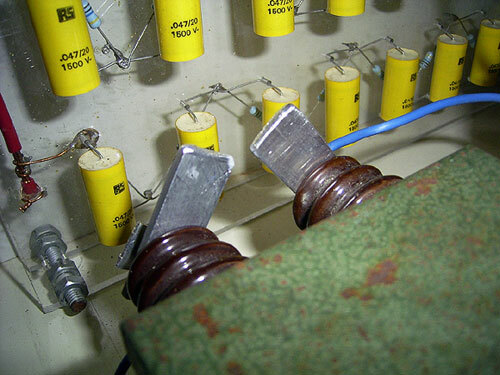 Analysis revealed that the 15kV 30mA transformer was now fully dead! (Was half spoilt at first, so I was using the other half, 7.5kV 30mA. I'm not sure what's wrong as the whole transformer is resin potted, and thus I cannot dismantle it. 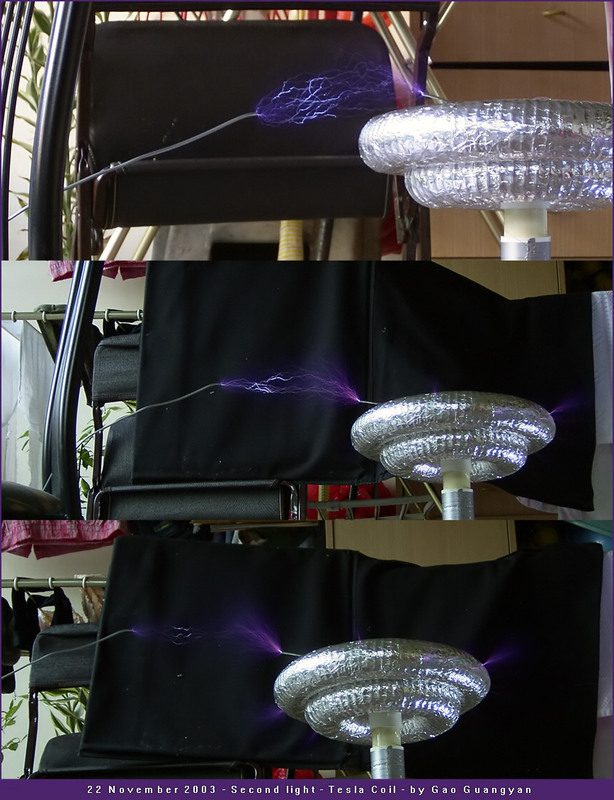 Unhappy with the loss of my 225W unit, I decided to plug my dual MOT power supply from my Tesla Coil 2 supplying 12kV DC pulses to the coil. Even though I did not tune it or adjust the spark gap, there was significant arc length improvement and ground arcs were much thicker. This is evident in the photos below. I need to get a new NST to power my coil. My friend, known as raptor, happens to have a 6kV 30mA NST lying around and he is willing to trade with me it for an amount of magnet wire. Although it's only 180W this time, I have no other choice... I will be going to his house to collect it tomorrow. Today I got the 6kV 30mA NST from my friend. The NST is the type which is in a metal container, potted with a black substance (probably tar). It's by Standard Electric Works (Hong Kong), and the date says Sep 86 on it. Though a bit rusty, it works perfectly! It's a center tapped unit. I completed the wooden stand today. The NST is the green box with a black sticker on it, and weighs around 4 - 4.5kg. I bought 4 plastic wheels (cost $5) and screwed them on the bottom to increase portability. I also built a bigger, more durable spark gap. As you can see, there are 3 2inch long copper pipes bolted to a HDPE board, and a 6mm brass bolt at the end of the last pipe to make it adjustable. All connections are now copper or brass, no more steel. I also have a rather powerful fan blowing right on it, so quenching should be ok. Everything including a 3A EMI filter is attached on the stand. On the right, you can see the coil running. Performance is ok, though I'm still unhappy with the spark length. Notice the nice streamers inside the large 300W light bulb. There is one more thing to try.. that to the increase the height of the primary to increase coupling. 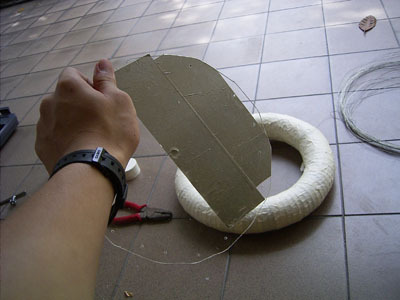 I hope to do that soon, and the coil will be more or less complete! Time to fix the primary! 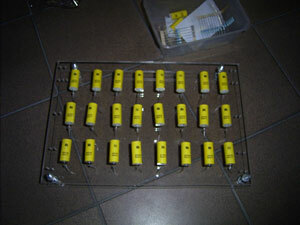 I cut out 4 6mm x 100mm x 30mm Acrylic pieces, and drilled two holes at the top 1cm. These are then tap screwed into the HDPE primary supports, effectively raising the primary coil by 2 cm to improve coupling. The hot glue and other stuff were scraped away (albeit leaving many marks on the acrylic base), and the supports were glued to it using Chloroform (trichloromethane) which is like a solvent for acrylic, allowing it to bond chemically. The second picture shows the aluminum safety spark gap. Also, you might have realized that I have removed the larger toroid from the coil. I tried with the small one only, and arcs seem best at turn 4.5 to 5. Streamers are now longer! (Primary would be tapped at turn 5.75 for the large one and the small one together). More test and arc photos will be taken tomorrow. I hope to improve spark length even further! I powered up to coil today. Primary is tapped at turn 5. I did something different: Since the coil is now running inside my house (instead of in the backyard), I can't get a proper RF ground without running a very long wire. As such, I connected the bottom of the secondary winding to the first turn of the primary. 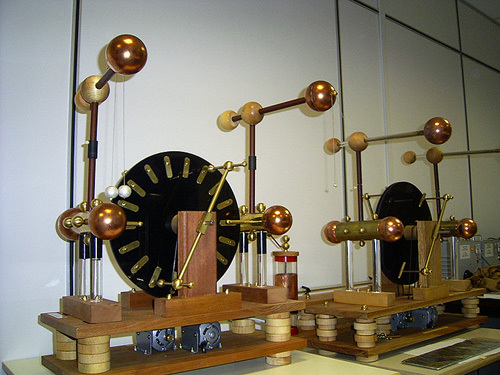 This configuration is similar to an Oudin coil/resonator. Although this configuration eliminates the need for a RF ground, and also eliminates the possibility of a primary or secondary strike, it injects dangerous primary AC currents into the output streamers. Performance is most satisfactory! I guess it works without much loss in a small coil like this one. The first photo shows the coil in action with a metal rod (stuck on a wooden pole of course) drawing arcs off it. 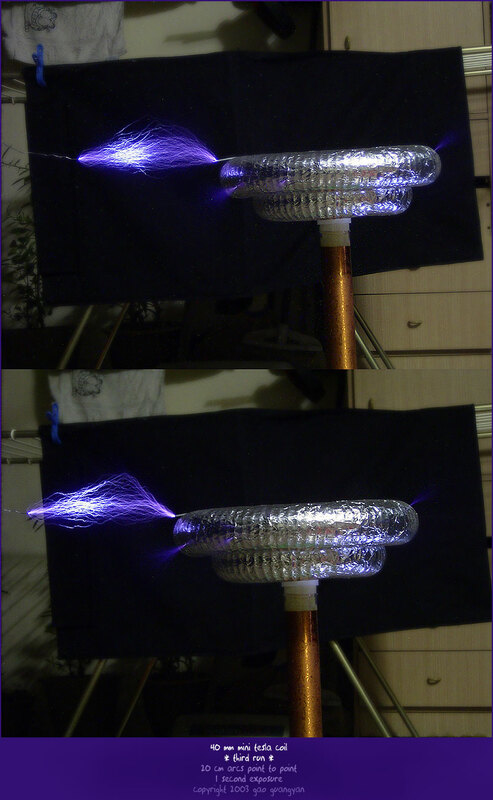 The second photo is a long exposure (a lot of digital noise) of the coil in action, and the last photo is the coil with a breakout point. The photo you see above is probably the best photo of the coil actually producing streamers. Performance has indeed increased! Note that without the larger toroid, there are even more streamers. I hypothesize that the toroid is either too small, or it is too rough. For the time being, I'll stick with this. Today's maximum arc length to ground is 25cm, and that's which 180W. Previously at 225W, maximum arc length was only 27cm. I am rather happy with the results, but I still hope to improve them. 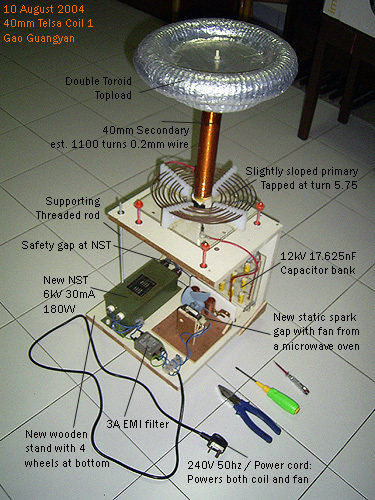 If you read about my 729J single stage coil gun (schcoil04) I did for my school's research project, you will know about my project mentor, A/P A. Kursheed from the National University of Singapore (NUS). After hearing about my Tesla coil, he was extremely interested. 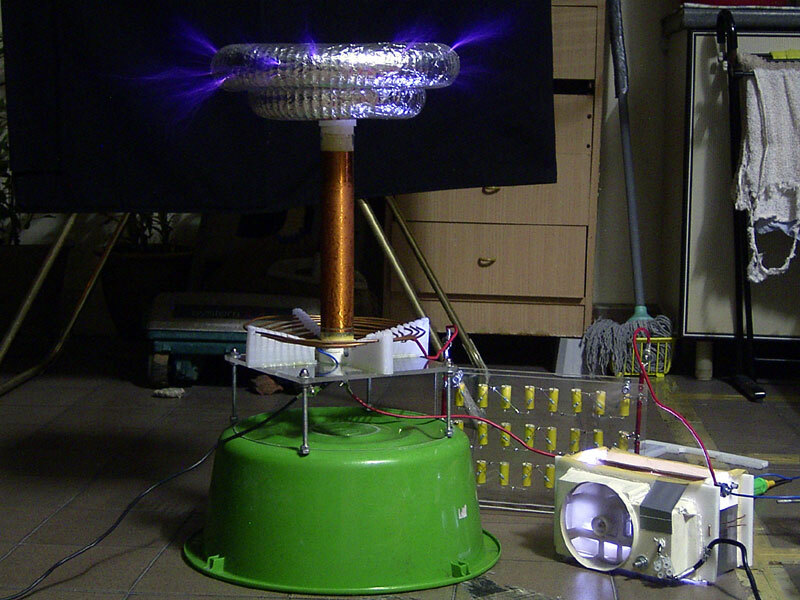 Since I had just completed fixing it together in a nice base, I told him about my Tesla coil. He wanted me to bring it down to his lab, which was exactly what happened today. 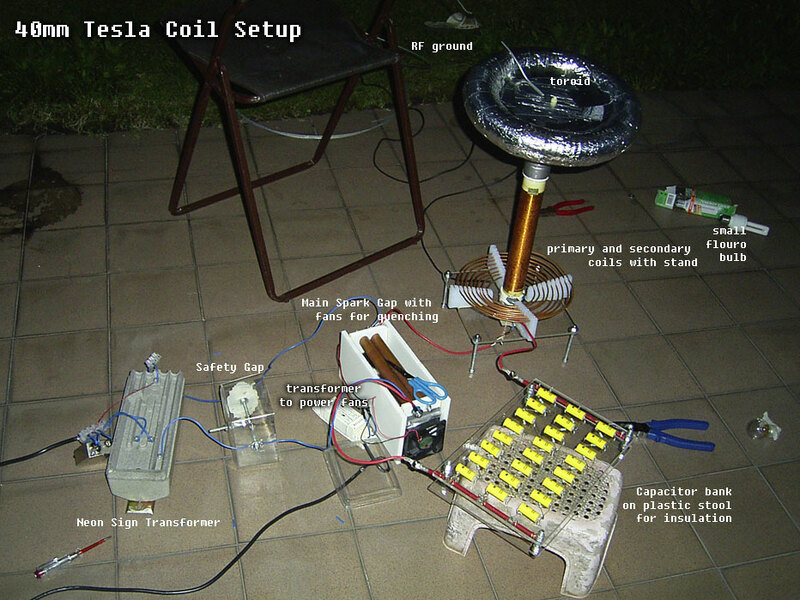 In the photo on the left, you can see the coil in his lab. There were some really large and well built Whimshurst generators (motorized), with very good performance. 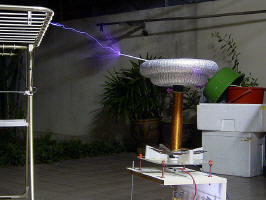 There was also a commercially made tesla coil at the lab. Notice how tall the secondary is. The wire used to wind it was really thick. Although the construction was rather good, performance was actually worse than my own coil! 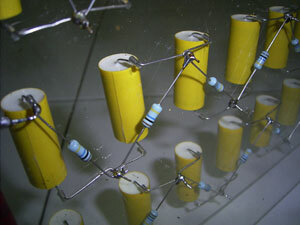 The last photo shows the Mica transmitting capacitors with a multiple tungsten static gap. My mentor was very pleased with the performance of my coil, and he wanted to keep the coil for maybe a few weeks to show his students. I will collect it back soon. He might also want me to talk and advise his students on this area. The coil performs well and as expected! I'm glad to see it still alive and working well after 4 years! It's 2012 and I have a new camera. No modifications have been made - I just wanted to see how the coil has been doing. I gave it a quick dusting down and fired it up. Worked 100% as expected! Enjoy the photographs! It's also interesting to see the improvements in camera technology since 2003! Until next time my friends! Stay safe and thank you for visiting my website! If time permits, I'd like to work on a small, compact and efficient spark gap coil combining things I've learned over the years. 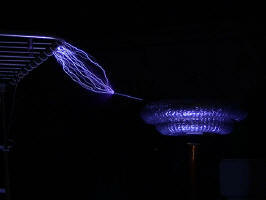 For now, Long Live Tesla Coil 1! 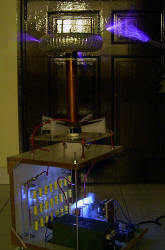 The Tesla Coil is officially complete! 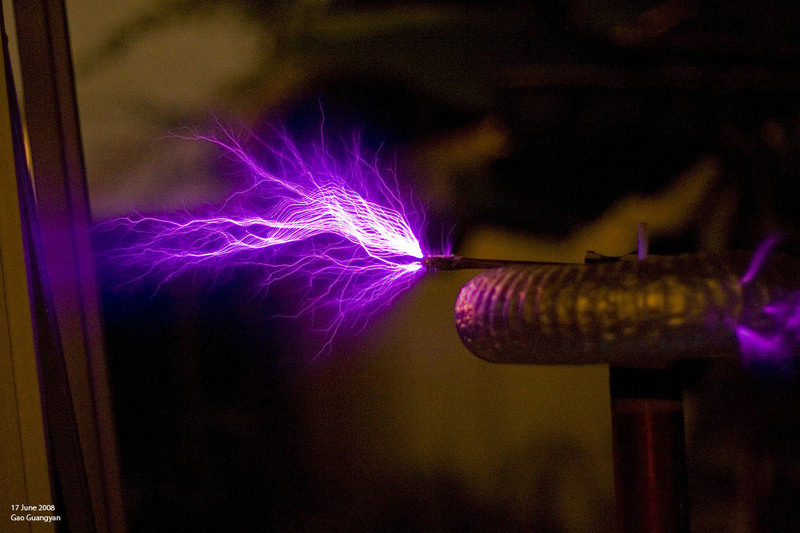 It has had been a wonderful journey so far and has been a huge springboard into the world of Electrical Engineering and Tesla Coiling for me. Although this coil didn't perform to it's (rather ambitious) 50cm goal, I learned a whole lot and am happy with how it turned out. I would like to thank the following people, for this coil would not have been completed without them. Loneoceans Laboratories. Copyright (c) 2003 - 2013 Gao Guangyan, All Rights Reserved. Design 3.